Love quinoa and want to make it perfect every time? Learn to Cook Quinoa in a Rice Cooker? It is easy, fool-proof, and perfect for meal prep. Here is how! As the author of two quinoa cookbooks, I get asked a lot of questions about cooking quinoa. One of the most common questions is what method for cooking quinoa is the easiest. The first time someone asked me how to cook quinoa in a rice cooker, I had to confess that I’d never tried. Obviously, that had to change! I gave it a try and have been hooked ever since. Cooking quinoa in a rice cooker has become my go-to method. 3.1 How Can You Cook Quinoa in a Rice Cooker? 3.2 Is Quinoa better for you than Rice? 3.3 How Much Quinoa is 1 cup Cooked? 3.4 Why Do You Need to Rinse Quinoa Before Cooking? Rinse quinoa in a fine metal strainer. Add the quinoa and liquid to the rice cooker. You will use two parts liquid and one part quinoa. If your cooker allows you to add in herbs and spices, you should go ahead and do that now. Quinoa is great at absorbing the flavors that it is cooked with! Once you turn your rice cooker on, it will take between 15 and 25 minutes for your quinoa to cook. Times will vary depending on the rice cooker and the color of quinoa you are cooking. Every rice cooker is a little different, so you will need to experiment with your cooker. Generally speaking though, you will want to use your white rice setting. The first time you try it, I would cook red quinoa for 25 minutes and white quinoa for 15. You can make adjustments from there. Don’t forget to rinse your quinoa before you cook it! You will want to rise it in a fine mesh strainer under a steady stream of water for three to five minutes, or until the water runs clear. It is possible to buy quinoa that is pre-rinsed – it will explicitly say so on the packaging. In this case, you may elect to skip rinsing. Quinoa bought in bulk bins should always be well rinsed. You may want to soak quinoa before cooking it. Many people find that soaking helps to make it more digestible. To soak quinoa, rinse it well and then cover it with water and 2 tablespoons of raw apple cider vinegar. Let sit for 12 hours, and then rinse again. If you are going to cook red quinoa in a rice cooker, I recommend soaking it since it tends to be firmer than white quinoa. How Can You Cook Quinoa in a Rice Cooker? 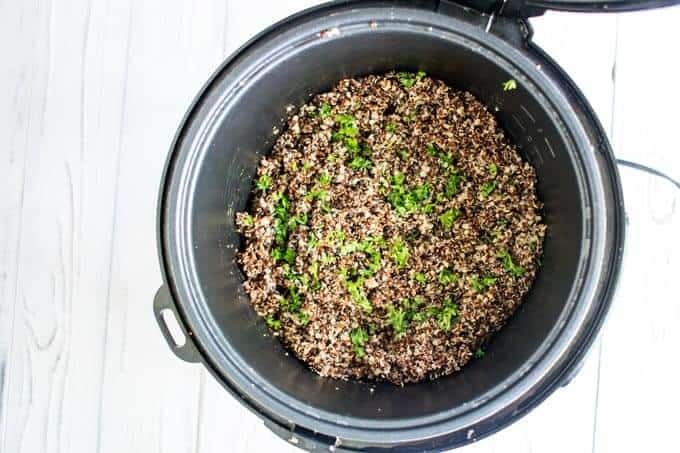 Cooking quinoa in a rice cooker is very simple! Just put rinsed quinoa and your desired rice cooker and cook for 15 minutes. If your rice cooker has an automatically timed rice cooker function, you can use this setting as well. Please note that every rice cooker performs a little differently, so it may take some tweaking the first couple of times – but once you figure out how your cooker works you can expect perfect quinoa every time. While both quinoa and rice (especially brown rice) can both be parts of a healthy diet, quinoa has the edge nutritionally. 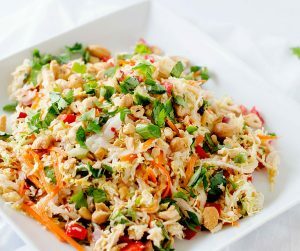 It contains more protein, and the protein quality is superior to that of rice. This is because quinoa is one of the rare plant-based foods that contains all of the amino acids we need for health. How Much Quinoa is 1 cup Cooked? Quinoa cooks up in a 1:3 ratio. This means if you need one cup of cooked quinoa, you will need to cook 1/3 a cup of quinoa. If you cook one cup of dry quinoa, it will yield approximately three cups of cooked quinoa. Why Do You Need to Rinse Quinoa Before Cooking? Want perfect quinoa in less than 30 minutes? Your rice cooker is about to become your new favorite kitchen appliance. It is a game changer for cooking quinoa. 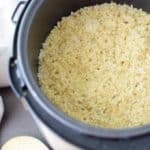 Here is how to cook perfect quinoa in a rice cooker every time! Place quinoa in a fine mesh strainer and rinse with cold water for three to five minutes, until the water runs clear. Spray the bottom of the rice cooker with olive oil. Place the quinoa in the rice cooker. Add 2 cups of liquid. Unplug the rice cooker and allow to sit for 5 to 10 more minutes. Tip: I often buy pre-rinsed quinoa but I still rinse it. Whether you do or not is a personal choice, but I find well-rinsed quinoa easier to digest. I love quinoa and I don’t know why I don’t cook with it more often. There are so many delicious ways to incorporate it into my lifestyle. I never thought to use my rice cooker! There really are so many ways to use it! Bummers that my rice cooker does not have a timmer. I really like how easy this is. It may work on your white rice setting! i have tried to cook quinoa in a sauce pan once and it was a disaster… it burnt and stuck to the pan! i don’t have a rice cooker unfortunately! That happened to me when I first started cooking it too. 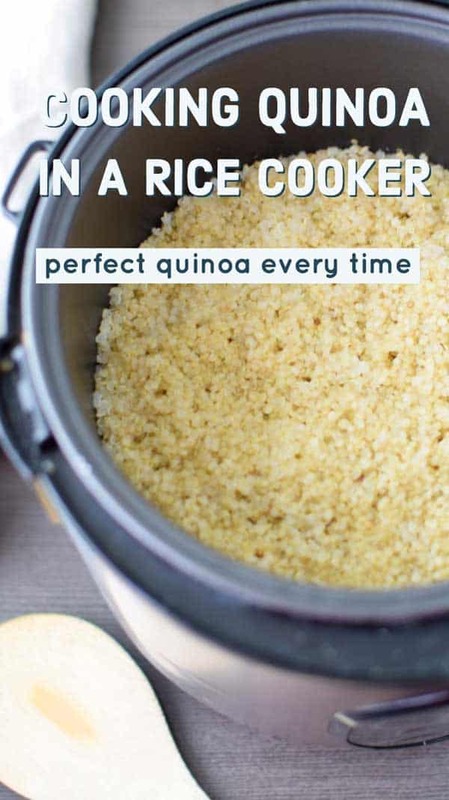 I have never tried quinoa before, but this is the 3rd recipe today I have seen that uses a rice cooker! Now I’m thinking I just may need one! Not sure why I don’t have one yet, I love rice.. and want to try quinoa now. It is a great kitchen tool to have. I have a rice cooker and I definitely want to try this recipe. I didn’t know that quinoa had to be rinsed so thanks for the tip! I don’t have a rice cooker but it on my list of wishes for my kitchen. I also love quinoa. So good for you! I absolutely love quinoa. 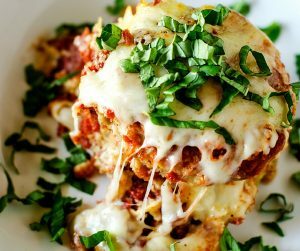 This looks like such an easy and healthy way to cook it right on up! This has to be one of the easiest ways to cook quinoa! Yummy! It really is such an easy way to cook it! Really useful post, If I can cook quinoa in rice cooker, then I don’t need to baby sit them. I like quinoa to make salad and need to cook more often thanks for sharing the this easy method. Oh geez this is awesome and I would like to try at home. I have a rice cooker and I’m excited to cook quinoa with it. What about if to cook this dish in the instant pot? Would it have the same taste and consistency? 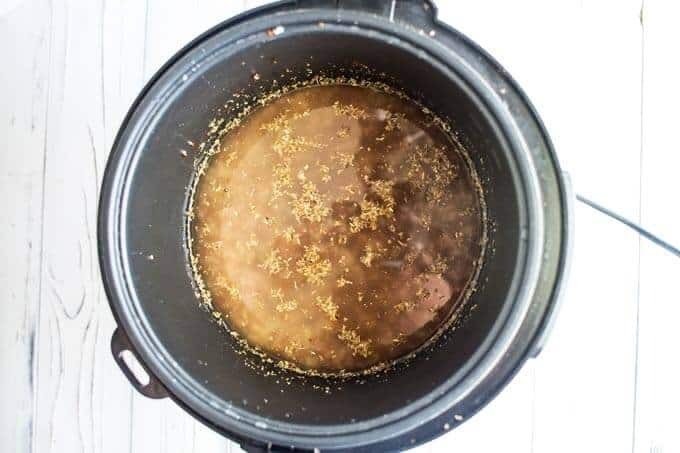 I have a post on how to cook it in an Instant Pot. It works great! 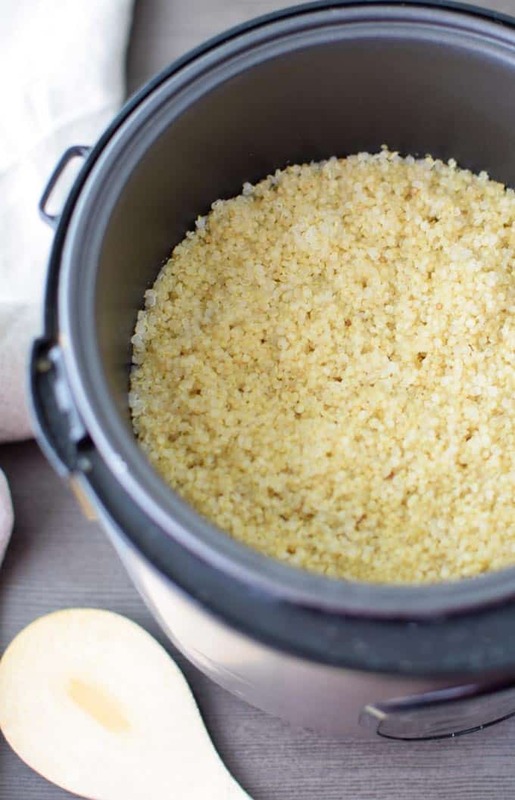 This is the easiest method for cooking quinoa in a rice cooker. Thanks for the detailed instruction!